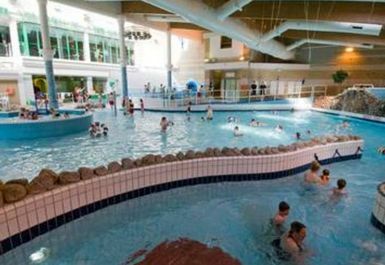 Woking Leisure Centre and Pool in the Park has a 6 lane competition swimming pool (25m long x 13m wide) with spectator seating. Or, why not try the 'Leisure Lagoon'. Here, you will find flumes, indoor rapids/lazy river, bubble pool, fountains and wave machine. Very busy at 8:30 in the morning - 6 of us all in one lane, and not of the same speed. Plenty of showers, lockers, and changing rooms. Good quality swimming pool/leisure swim. Parking likely to be in nearby overspill during peak time (weekends and mid-morning). Always worth a visit. Good value. On weekends, definitely less busy than other pools in the area. it was excellent work out, wasn't busy in Gym or the Spa. Very nice staff always happy to help.